Steel-cut oats are also known as "Irish Oats" are the inner part of the oat kernel which have been cut into only two or three pieces by steel, instead of being rolled. They are nuttier and chewier than other types of oats, but extremely satisfying. Full of nutrients, fibre and antioxidants they are a low glycemic carb with a rating of 42 on the Glycemic Index, therefore will not cause a blood sugar high or insulin spike. They are ideal for fuelling your activities, for adding extra “clean” calories or simply boosting your carbohydrate intake throughout the day. They are also great to consume as part of high carbohydrate breakfast or pre/post workout meal along with some form of protein. Plus if you are looking for a more nutrient dense alternative to Dextrose or Maltodextrin then our Steel Cut Oats or Oat Flour are perfect. Available in 4kg packs and bulk buy discounts. Rinse with water & pour an organically flavored protein shake over the top. Also can be used for muesli, porridge and baking. If cooking, they may take slightly longer than other oats due to being minimally processed. This is a great product at a great price. I took the advice of others on here and I soak my oats overnight or for a day. I cook them up and store in the fridge to save time. 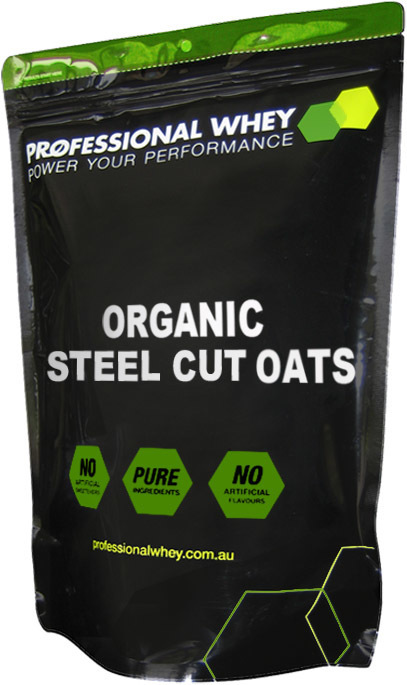 Been paying an arm and leg for a little ton of steel cut oats for most of winter, until I found ProWhey! Saving so much money, getting superior product, home delivered - what's not to like. I'm a convert, Uncle Toby can shove it up his armpit! Pro Whey is the only way! These oats are great, I love how much energy I have throughout the day and during workouts with these carbs. Cooking time takes a bit longer but it keeps in the fridge/ freezer if you cook it in bulk. Well, for sure, don't try and cook them in the morning if you're in a hurry. I literally put them in a pot with 1/2 water and 1/2 milk the night before and bring to the boil. Then, turn off, and in the morning, just heat up again. The kids (eh hrm) love it with butter and brown sugar. Great value and great product. I was put on to them by my nutritionist and haven't looked back! Great product, great taste ( a bit nutty ) and great value 4kg bags what more can you ask for! I swear by these to get my carbs/fibre in the morning. I cook them in a slow cooker in bulk and keep in the fridge. And being a type 1 diabetic they are excellent for blood-sugar control as they are low GI. Highly recommended! After my first failed attempt at cooking these (they exploded in the microwave) I absolutely love there texture and nutty flavour. They take longer than normal oats but worth the wait and you can’t go past a 4kg bag for that price either! 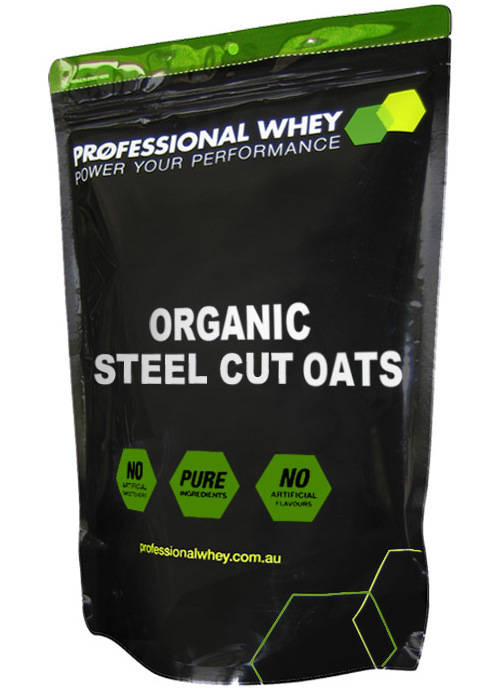 I've been looking for locally grown Steel Cut Oats for ages, and now to finally find Australian "Organic" Steel Cut Oats at Professioanl Whey is wonderful! This is the best porridge I've ever had, and I too soak it overnight for better digestion. Great quality product! I had been searching for steel cut oats for a while as they are the least processed form of oats (and therefore healthier!). I simply mix it with my protein shakes and chew them once they have moistened. I also add them into the mixture of my homemade protein bars to add some complex carbs to it - yum! To top it off, the bag is MASSIVE and lasts a while - great value for money! These are fantastic! I've tried a couple of recipes but the best basic one I found (and you can then add whatever you like to make it exciting) was... In a deep frypan/pot toast 1 cup of steel cut oats in a tablespoon of coconut oil. It takes only a couple of minutes for the oats to slightly brown and a beautiful smell to fill the kitchen. Add 3 cups of water and 1 cup of milk along with some cinnamon and vanilla powders to taste and simmer ever so gently for around 30 or so minutes. This isn't a quick thing but worth the wait and effort. Tastes great served warm with cold vanilla yoghurt (sugar free of course!). Heat up leftovers in the microwave for an easy breakfast for the next couple of days! Enjoy experimenting. I normally have oats for breakfast but had read that steel cut oats has more fibre and protein so I decided to give it a go. I absolutely LOVE it! If you are used to traditional oats you will find that it takes a bit more effort to chew. Once you get used to that, there's no going back. I definitely notice the difference. I find that I feel fuller for longer compared to traditional oats and have more energy. As with all Professional Whey's products, its quality all the way and no nasty additives. What you see is what you get. It's a great price as well. Can't recommend this product enough! What you mean no one has their oats for breakfast anymore? Ridic ! First thing I noticed about this product was the absolute freshness! Sort of like the first thing you notice about a girl and her bad teeth (or good) But before I digress, this stuff is quality. But please, soak it in clean water the night before: not only does it make it easier to cook; taste better; but it also won't rip the inside of your stomach up. Do a search on oats and soaking it in water and you'll find out why. I've had normal oats you get from the shops, cooked it as usual and felt the insides of my stomach tear up (As I guess I have a sensitive stomach ever since I cleaned up my diet so I notice these things) but with OSCO I don't get any of that, plus it's a nice energy boost. And there's plenty in a box so it'll last you a while. Great value for money.